Canvas wines are made using a handcrafted, artisan approach resulting in wines with a depth and richness of character that only grows with age. 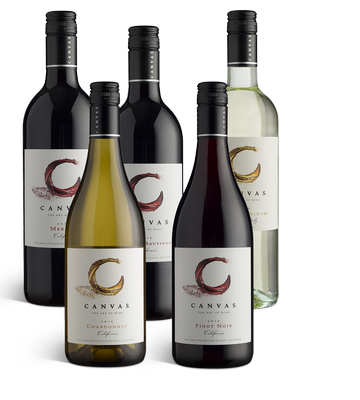 The Canvas brand was created by an inspiration for a love of fine art, just as wine is an art in itself. To ensure the best quality for Canvas wines, we source fruit from vineyards throughout California where each varietal takes on its purest expression. For our Pinot Grigio we went direct to IGT Veneto, Italy to import a wine consistent with the quality of our domestic varietal offerings. Careful handling in the winery allows vibrant varietal character to shine through, whether it’s the intensity of California Cab or the bright complexity of Chardonnay. It is this attention to quality that has made Canvas wines a success for the last 10 years. Inspired by a love of fine art, Canvas wines are made using a handcrafted, artisan approach resulting in wines with a depth and richness of character that only grows with age. Developed exclusively for Hyatt by Michael Mondavi and his son Rob, Canvas wines set a new standard of excellence in dining.